What’s the best type of content that can bring you the amount of value you want for your site? Answer: original research. 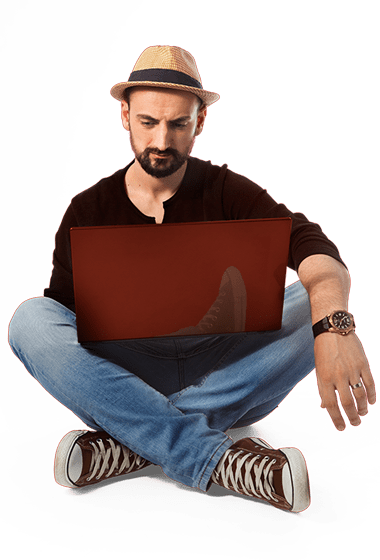 There is one type of content that can drive you backlinks (hello SEO guy), that can help your brand awareness (hello brand managers) and also can make it viral in your industry (hello social media managers). Some of you may say that that is a high quality blog post, others will translate it in 10x content (thank you Rand for giving this term for the marketing world) but there is the type of content marketers who will shout it loud and clear: research based content. In today’s article I want to share my first experience with this type of content with you. 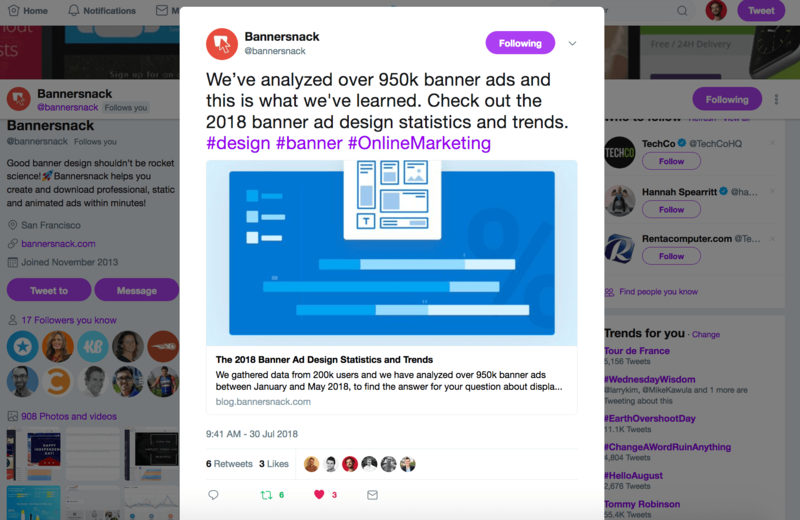 Because I’m in charge at Bannersnack with the content marketing and I’m always curious on how we can grow our brand, create valuable content for our industry and also help our customers learn more about online banner ads. 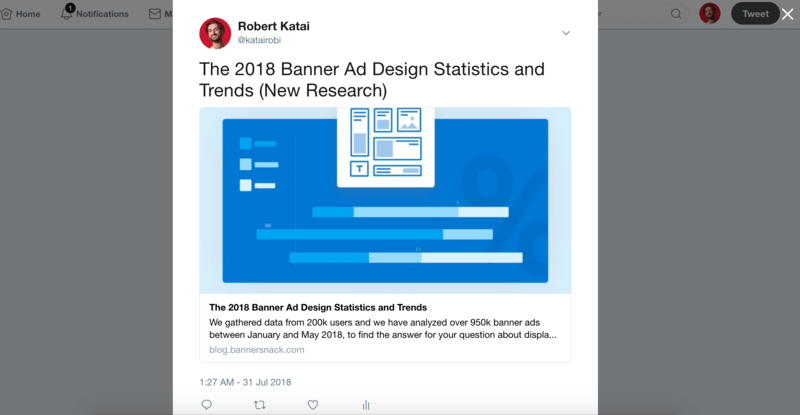 That’s why after I was an avid consumer of Content Marketing Institute Benchmark and also being a little envious on Orbit Media blogging statistics (sorry Andy Crestodina) I decide that now is the moment when we must create our first banner ad design statistics original research. 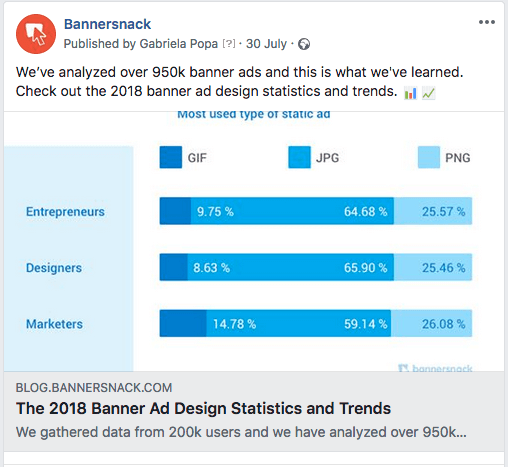 Something that must be a very helpful information for designers, marketers but also content creators around the world who want to learn more about banner ads. So we started looking at our metrics, analyzing them and searching for a starting point. Hopefully, Michelle Lin launched Mantis Research with some awesome content on their blog. I love the fact that they walked their talk, launching a report with Buzzsumo about the State of Original Research. All of this was very helpful because I really wanted to do this kind of content. I believe so much in quality content, but not only from the visual point of view, awesome user experience or great words, but I also think that a hiqh quality piece of content is something you will refer every time you have the opportunity. I won’t get very deep into how we’ve done our research (maybe about this topic in another article) but I will move forward and talk about our marketing strategy and how we promote it. Why? Because I believe that after you hit the publish button, your work is not done. In fact, that is the moment when your marketing brain should start working. How to promote and market your original research? That really means that you should start with your own audience. Think about your community, think about the ones who are reading you every day, every week and first of all, create the content for them. In our case, we published the new research on Bannersnack’s blog. After we created our own research we thought about where should this report be published first. So we knew that our blog is a very good place where to publish it, because there are thousands of readers who are reading our content daily. But there are also other ways you could publish your new research. If your purpose is to get new leads, you can easily create a new landing page, upload your research over there and create a funnel where the user can drop his e-mail and unlock the content. So we created a new blog post for this research. All of the chapters were published in the article and every topic had its own visual, branded with our colors and brand assets. I got inspired by Andy Crestodina’s research about the blogging industry and we also created a TL;DR category of the article. Because I believe that there are also readers who don’t like to spend too much time on consuming one big piece of content, so for them I made it easier to find out what they want. The structure of your research is really important. Even if you have very valuable information it doesn’t mean that everybody will want to read everything your publish there. 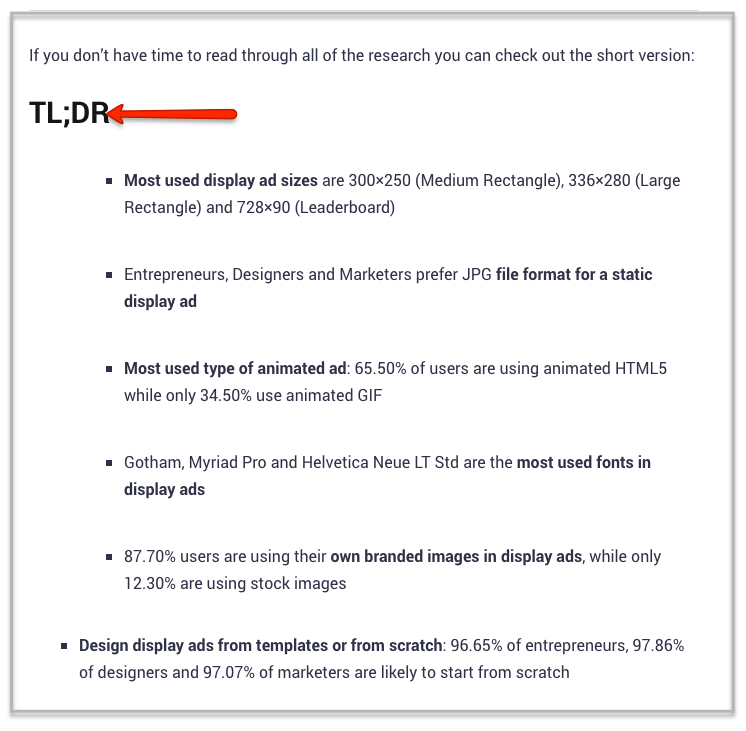 So make sure that you create a TL;DR category of the article, or if you have an ebook, just make sure that in the first few pages you have a short and very good looking summary. Now that the article is published and everything is ready to be promoted, what is the next step? First of all, look at your own audience. As I already said, those people should be the first ones who must know about your new research. Before you even publish it on social media, before you even do a press release or boost the content, you have to respect your audience. For example, after we published the content, we used our Intercom app and told our users about our new research. So we created a new simple message through which we told them about it. Everyone who used the banner editor that day, received a message from one of our colleagues about the new Banner Ad Research. But they could also let us know how they felt about this content, so we gave them the opportunity to tell us very shortly if they liked it or not. 88% of the users who saw the message reacted positively to this message. This was an example on how to use a pop-up message on your website. Well, there are 2 ways through which you can promote your new original research on social media. First of all, you publish it simple, with images on your Twitter, Facebook, Linkedin and on every network you have an account on. It’s a moment of celebration and you need to do it because it’s something you have created and you want to make your audience a part of it. That’s how we promote it on social media. We used our main networks and used our main visuals to attract new readers on the blog. The second one is to boost your content. The good thing with social media posts is that you can boost your content to the targeted audience. So we created special videos about this research and used them to boost the research on Facebook. Here’s one of the videos we used to target one type of audience. 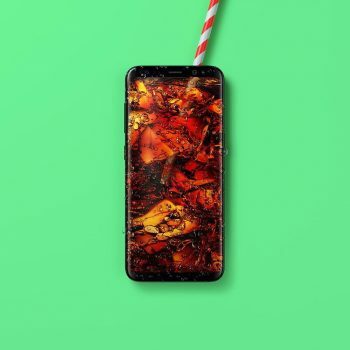 Social media advertising is a great way to promote your original research to a new kind of audience who didn’t hear about your brand, or who didn’t like your page, but they would be interested in your new research. But there is one problem that many brands have when dealing with social media. A content marketer and a social media marketer should work together, but there are also other employees that are using social media and they can be a real advocate for their brand. Today almost everybody has at least one social media account, even if it’s Twitter, Facebook, Linkedin or Instagram. So why not ask your marketing colleagues to share this content on their social media profile? It’s not something compulsory but it would be really helpful for you and for the content. Social media can also be a great way to promote your new original research with the help of influencers. You know that I mentioned Michelle before and Mantis Research. 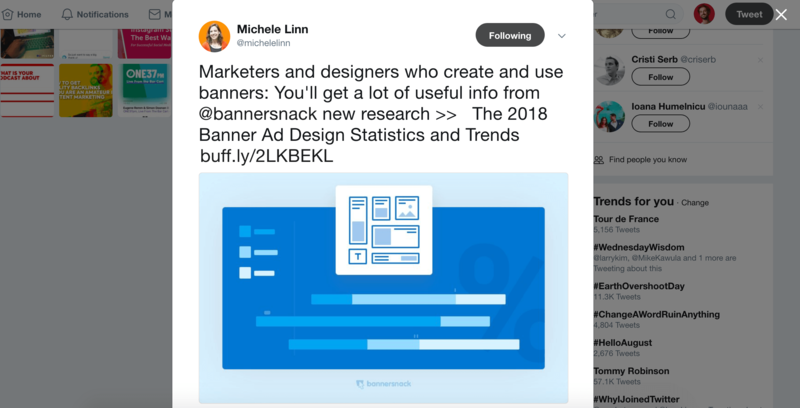 After we launched our first new research about banner ad design statistics and trends I was so excited that I contacted Michelle and told her about this piece of content. She was so glad that she shared it on her own social media channels and this was really helpful for us. I didn’t even ask her to do this, but this was like a “Thank you” note from me to her. Here’s an actionable tip for you. Before you release your new original research, make sure that you know who are the influencers in your industry and connect with them before you publish the content. 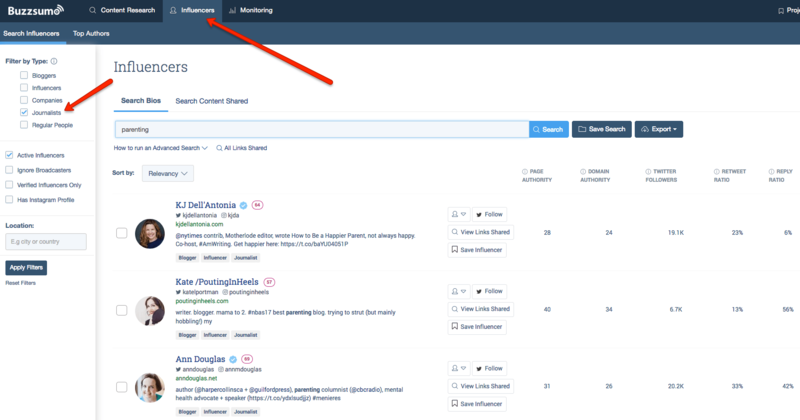 A great tool to understand who are the influencers in your industry is Buzzsumo. You can choose the Influencer category, right down your industry, check only the category you want to see (bloggers, influencers, companies, journalists, regular people) and then hit the Search button. You will see a list of people you can connect with. Here is a simple example I’ve done with the “parenting” keyword and I only checked the “Journalists” influencer category. Forums and online communities are a really great way to promote your research. There are hundreds of forums, Facebook groups and other types of online communities where you can promote your content. But make sure that you won’t share your link and wait that people will click on it. Before you jump into an online community, you must be an active user of it. That means that you must do the work before. For example, I’ve used GrowthHackers community to promote our new research. I logged in and add a new post. 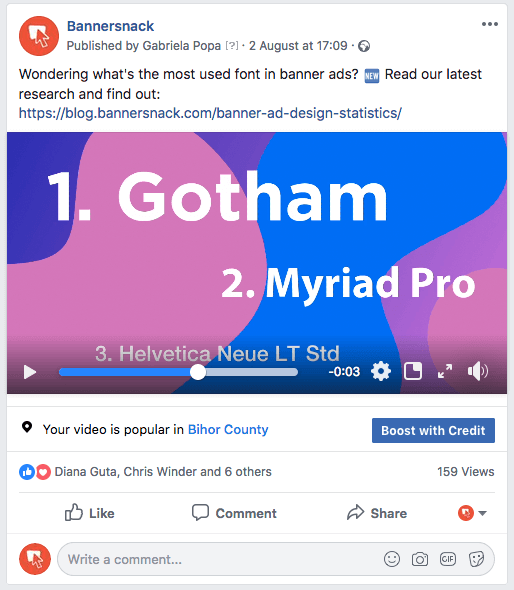 And because the post was shared in the right category, it got the right traction it needed and it was a trending post in design and Google Adwords. And now that piece of content has almost 2k views on Growth Hackers. I also believe in the power of Facebook groups and there are many reasons why today a brand should create its own Facebook group. 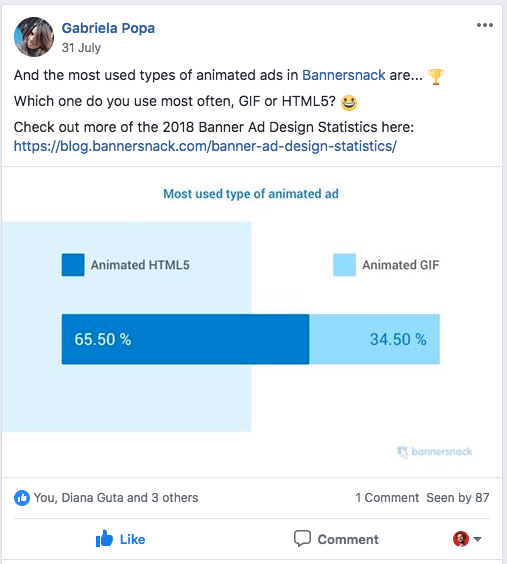 So here at Bannersnack we created our own Facebook group and we are connecting with our community using this type of communication. Of course, we promoted our own research on our Facebook group too with a personalized message. Social media is a great way to promote your own research not only once but several times on different networks with different messages. Think about it. If you have created a research based content where people answered 10 different questions, you could easily promote every question as a post and link to the research on different social networks. Now you have several messages linking to one single type of content. You can easily reshare it. Many of you may think about guest posts as an only SEO strategy where you can get a link and that’s all. But I strongly believe that guest posts can bring much more value when you invest more quality in one content. When quality is over quantity in your guest post strategy, there will be a win situation for you. As I already told you before, your job as a content marketer is not done after you hit the publish button. Here comes the work when you have to put it out there, connect with other websites and make sure people will hear about your research. Sometimes all you have to do is just send a good e-mail, tell people about your research and if they find it useful, they will write about it. But other times, you have to do more work: outreach, write emails, connect with bloggers, ask if they accept guest post and if you have a positive answer from them, you have to put out the work. I see tremendous value in guest posts when you do them right. That’s why I love to do guest posts, I love creating content for other websites and bring them high value. So after we published the research I started outreaching the websites and blogs that are in the design niche and I managed to write a guest post for this blog. Well, even this article can be as a guest post in which I’m talking about our experience on how we promote our new original research (you see what I did there?:D). I believe that co-marketing can be a really great strategy to release a new research and promote it on both websites/blogs. You can do a co-marketing with a media website, another company or even a blogger. It really depends on what the purpose of the co-marketing project is. 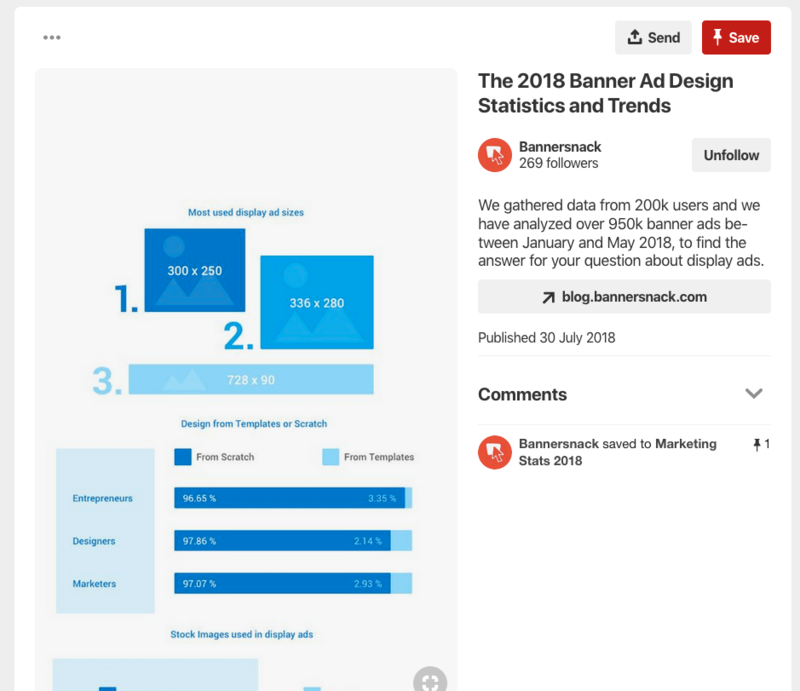 The first type of co-marketing I saw was when Content Marketing Institute launched their annual B2B Content Marketing Benchmark along with Marketing Profs and you could read on both websites about this study. Another recent example I saw was from Buzzsumo and Buffer when they partnered to release a new research based on what they analyzed and saw among 43 million Facebook posts from the top 20,000 Brands. And in this case, the content was viral and had more than 3.6k social media engagement. This is another kind of marketing strategy you can use to promote your new research, because you can gain another audience, promote each other and also let the industry know that you are open to collaborate to create valuable content. I know that there is a lot of work to do when you are about to promote your research. Even when you finished your research, you have done all the things that I told you before you still can promote your new original research. How? Using an automatic promotion tool. I’ve found Quuu Promote as a great tool to use and promote your new research to influencers. All you have to do just submit your URL, upload a Featured image and edit your text, choose your topic category and you are done. Real people will share your content on social media. This was only a short example on how to automate your marketing efforts to promote your new research. I believe that there are also other tools, so all you have to do just check them out, see what’s best for you and try it. While the content is promoted you have the amount of time to think about your next new original research and start doing the first steps. Content marketing is divided in 2 words: content and marketing. Content is everything related to content, from research, creation, editing and publishing. Marketing is everything you to do bring people to your content, even if we talk about SEO, paid, content hacks and other techniques. So even if you create a research based content, you have a lot of work to do after you publish it. Now let me know in the comment section below what other kind of strategies you use to promote your original research.